Amanda's original recipe of Mushroom Pork Chops used to be a favourite of her husband's, but he seemed to have become bored of it of the years and was looking for ideas to spruce up her recipe. 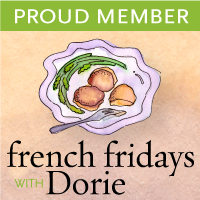 The theme for this round was "Lunch," and what can be more popular at lunchtime than a sandwich? 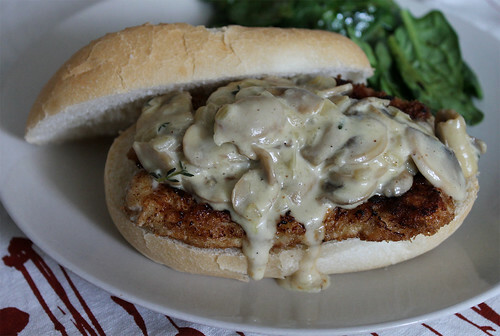 I was instantly inspired in doing a hot sandwich with a crispy pork schnitzel, topped with a creamy mushroom sauce. The original recipe used canned cream of mushroom soup. I skipped the canned soup altogether and used fresh mushrooms and cream in my sauce. I used pork chops for this sandwich, but this can easily be done with veal or chicken, if you prefer. Panko breadcrumbs adds some extra crunchiness and texture to the sandwich, but regular breadcrumbs can be used in its stead. This is such a simple recipe to put together, but the resulting sauce is super rich, luscious, and most importantly, deliciously. The sauce makes for a bit of a messy sandwich to eat, but trust me, the mess is so worth it when you're licking your fingers at the end! 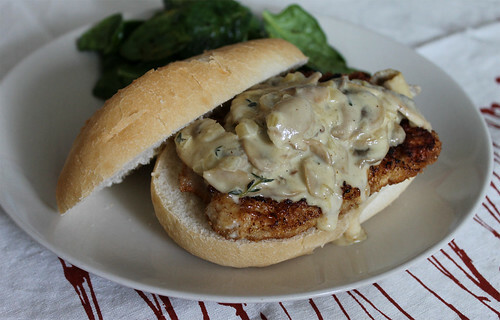 Check out my recipe for Mushroom Pork Schnitzel Sandwich over at Anyday Magic, and don't forget to "Like" my recipe if you like what you see!